Additives: Vitamins / Kg : A 25000 IU, D3 2000 IU / Kg E 220 Milligrams C ( Stable ) 300 milligrams, Astaxanthin / Probiotic/ Pre Biotic / Stimune/ EEC Permitted Colorants and anti oxidants. The high growth formula uses the finest quality ingredients to promote vigorous food uptake and nutrient absorption. 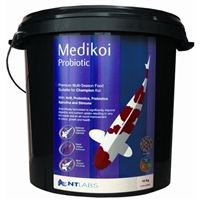 Combined with this the perfect protein to lipid ratio ensures maximum growth whilst maintaining the perfect body shape of champion Koi. The optimum balance of key ingredients ensures the lipids are used for energy so the 51% protein content can be used for healthy body tissue gain. 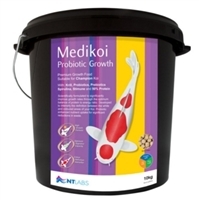 Medikoi Probiotic Growth is designed for use in the summer growing season. 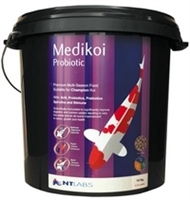 Medikoi Probiotic Growth provides both the beneficial probiotic bacteria for Koi but it also contains a food for the beneficial bacteria too in the form of a prebiotic (fructo-oligosaccharide). 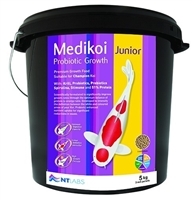 This combination ensures a vigorous population of gut bacteria and digestive enzymes which over time results in a vastly improved ability to absorb nutrients, optimises body mass gain and massively reduces waste. Allow up to 6 weeks for noticeable results, continue feeding to enjoy the benefits of the diet. What makes this food even more impressive is that NT Labs have added their Colour Definition Intensifier. The inclusion of Spirulina, Astaxanthin and Capsanthin promotes vivid and intense colouration to the areas of red, yellows, black and blues without affecting the areas of white, ensuring a clear definition between where the white and coloured areas on the head and body meet. The colour definition is more greatly intensified as the white is made richer and deeper and appears "cleaner". 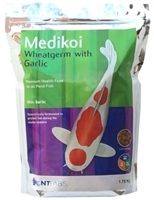 Medikoi Wheatgerm & Garlic is designed to provide top quality nutrition and protection from parasites during the cooler months. 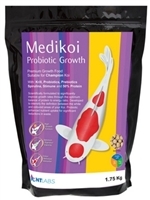 It is rich in easily digestible protein and the garlic has parasite repellent properties protecting the koi. The addition of garlic diffuses through the skin of the fish and any parasites which may be present react to these compounds by swimming away, reducing the risk of infestation. 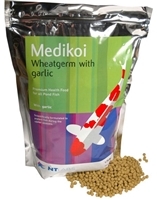 When rapid growth is not a priority, Medikoi Wheatgerm with Garlic can be fed throughout the year. It can be used to help stimulate the appetite if fish have been moved or "gone off their food" and will encourage them to feed again quickly. Additives (Vitamins / Kg): A 21000 IU, C 150 Milligrams, D 1500 IU, E 150 Milligrams.